Smartphone Clip Holder for DJI OSMO Mobile 2. Stretchable smartphone clip holder, suitable for 4-5.5in smartphone. Made of high quality plastic and metal materials, sturdy and durable to use. 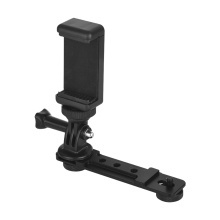 Function: After installing the camera on OSMO Mobile 2, you can use this extension bracket to view the shooting screen of the mobile phone in real time, two hands hold more stable. Note: Gimbal stabilizer, smartphone and camera are not included.